COPENHAGEN, Denmark--(BUSINESS WIRE)--3Shape, a leading innovator and manufacturer of 3D digital scanners and CAD/CAM software solutions for dental practices and labs, today filed a lawsuit against Align Technology for allegedly acting illegally to block competition in the marketplace for scanners for orthodontic treatment, including clear aligners. 3Shape is changing dentistry together with dental professionals across the world by developing innovations that provide superior dental care for patients. Our portfolio of 3D scanners and CAD/CAM software solutions for the dental industry includes the multiple award-winning 3Shape TRIOS intraoral scanner, the upcoming 3Shape X1 CBCT scanner, as well as market leading scanning and design software solutions for both dental practices and labs. Two graduate students founded 3Shape in Denmark’s capital in the year 2000. Today, 3Shape has over 1,400 employees serving customers in over 100 countries from an ever-growing number of 3Shape offices around the world. 3Shape’s products and innovations continue to challenge traditional methods, enabling dental professionals to treat more patients more effectively. www.3shape.com. *Contact 3Shape resellers regarding availability of products in your region or country. 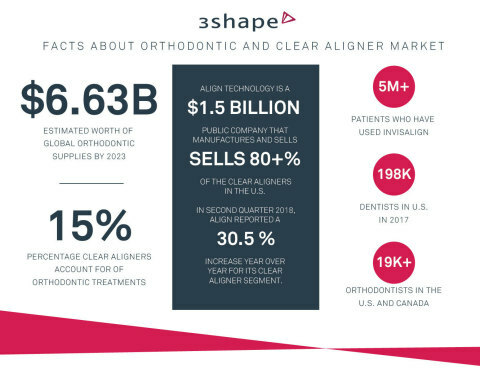 3Shape sues Align Technology for blocking competition in the marketplace for scanners for orthodontic treatment, including clear aligners.